So, the boss lady wants me to drive her around Italy and Southern France, covering both the first two weekends of the English League season. A disruption to the start of my season, but of course, not bad enough to rob me of all football. Hence on Sunday afternoon, we arrived at a second rate hotel, halfway between Florence and Pisa, and after a decent interval made my way to the nearby town of Pontedera. For many years, the divisions of the Italian League were called Serie A, Serie B, Serie C and Serie D, although for some reason Serie C was split into C1 and C2, and hence was both the third and fourth levels. Serie D is very regionalised, with nine regions. A few years ago, Serie C1 and C2 were re-launched as Lega Pro, but still with two levels, and regionalised divisions in both. The support for this level of football has been shrinking. About a decade ago, I remember recording that the Italian system like the English had over 100 clubs showing average attendances in four figures. The English numbers have actually increased in the last decade, but European Football Statistics only recorded 74 in Italy last season. The Lega Pro in 2013-4 consisted of two levels of two divisions, and a total of 69 clubs. For 2014-15, it was decided to change this to a single level consisting of three regional divisions. Hence Serie D, for the first time since I have taken an interest in these things is actually the fourth level. While none of the league divisions in Italy start this early in the month, the Coppa Italia is underway. My experience in other countries shows cup competitions that either have an open draw, or actually give the smaller teams home an advantage with chances to play bigger teams and even home advantage by right. Not so, Italy where everything is biased in favour of the selections from the top. In the first round, there are 15 ties, all on the grounds of Lega Pro clubs, the away sides being either Lega Pro or lower. I admit to being uncertain of how qualification is achieved, although there is a Coppa Italia Lega Pro (which would be the equivalent of the FA Trophy in England), and maybe a Coppa Italia Serie D as well. There are also regional cups. The 15 winners go into the second round, where all 20 home teams are from Serie B. At the time of the draw, Serie B had 21 teams, due to the bankruptcy of Sienna. However, Novara (one of the relegated teams) appealed against this state of affairs and gained what can only be seen as a pyrrhic victory. The league decided to return to 22 clubs, by promoting an extra club, rather than by reprieving a relegated one. The position went to…., after rivals, Pisa could not file all documentation by the deadline. So, at the time of the draw, one of the 21 Serie B teams suffered and away draw, along with the 15 winners from the previous round and four more Lega Pro clubs which had byes. There will be 16 games in Round 3, and 12 of the Serie A teams enter at this stage – all 12 will play at home. After 8 games in Round 4, the 8 qualifying teams will all be away to the privileged few, the final 8 teams from Serie A, (AC Milan, Torino, Inter, Napoli, Roma, Fiorentina, Juventus and Parma) enter with home matches in the middle of January. 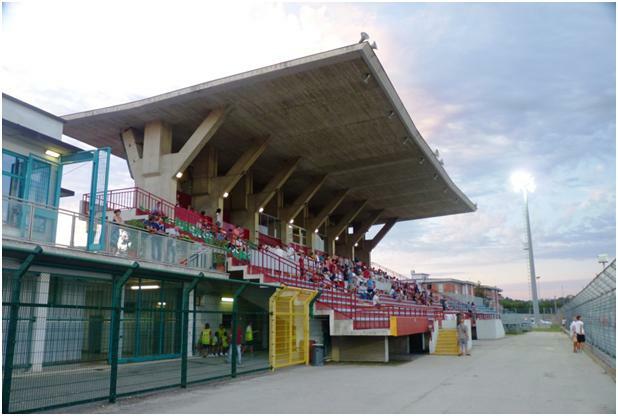 Pontedera play at the Stadio Ettore Mannucci, which they will share this season with Tuttocuoio, now in the same division. It sits on the Northern side of a town which I did not actually visit. It has a running track and a high fence, which means elevation is required to view the game well. The main stand, probably a fifties or sixties construction made mainly of pre-cast concrete, (including the roof) had around 360 seats in a good position, and a further 480 in front where the views are questionable. Alongside this is what I normally think of as a “meccano” stand – uncovered and held up by scaffolding, which seemed to be the abode of the local “ultras”. On the far side is a substantial and long uncovered stand, with two more small “meccano” constructs as an adjunct for when the away team has a lot of followers. 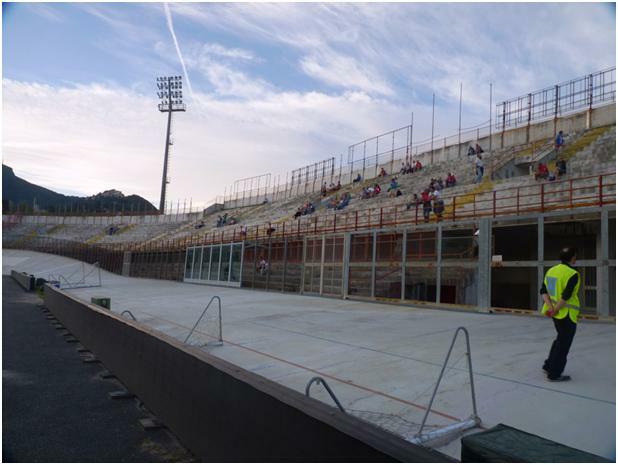 The substantial stand which is raised (on clearly visible concrete supports), so as the views will not be bad has a large fence down the middle to separate home and away fans. There is no spectator accommodation, or access behind the goals. Last season, Pontedera finished 8th in the top division of the Lega Pro, which qualified them for a play off, (8 teams in a knock out for one Serie B place). 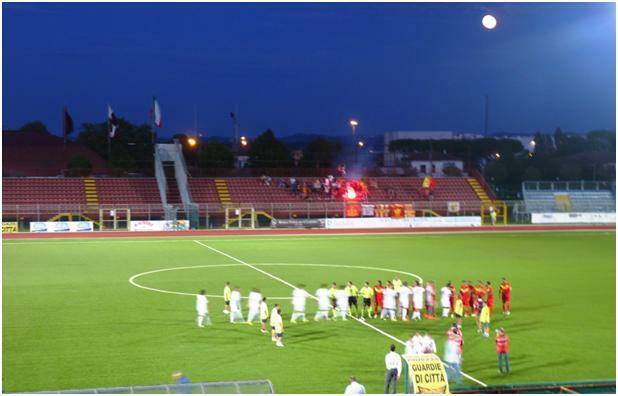 The visitors Messina, (from Sicily) were the champions of their ground of the second Lega Pro division. Messina are on the rise again in their complex history. A Messina club was in Serie A for two seasons in the sixties – with two intervening bankruptcies, (both within a couple of years at the end of the 90s), a new Messina club managed three seasons in Serie A from 2004, but this too went bankrupt when back in Serie B. The assets were sold by the courts in a blind auction, but the club, now named AC Rinascita Messina were in Serie D. They won promotion out of this in 2013. Amazingly, considering the distance from their home town, which means that if travelling home by road straight after the game, they would still miss breakfast, Messina had about 60 fans in their section, with a good number of flags on show. Pontedera have never been higher than their current status, but do have one claim to fame with Marcello Lippi starting his management career here. The club are nicknamed Granata, a reference to the colours they normally play in, although for this game, Messina played in Red (with a yellow chevron), so Pontedera were in all white. I think these were not the official shirts for the season – both teams lined up as 1-11, and there were no sponsors names on either club’s shirts. 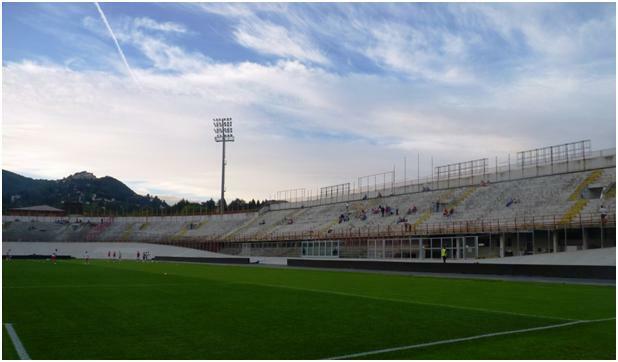 Messina will not play Pontedera in the league, but with only two regions last season, they did have to travel this distance to play Tuttocuoio, (who used a different stadium then). Pontedera has the better of the early exchanges, but there shooting was woeful, and by the middle of the half, Messina were well on top. As such, it was no surprise when they took the lead. A well taken free kick by Vincenzo Pepe providing the opening score. Messina did not push on from this though, and instead fell back to the own defensive areas, giving Pontedera a better chance. Still the equaliser came as something of a surprise – Luigi Grassi’s free kick from the right being easily covered by the Messina keeper, but he mishandled it and saw it sneak just inside the far post. I was talking during the game to a local referee, who assured me that Pontedera were a full time professional team, and that the majority of Lega Pro clubs are full time. 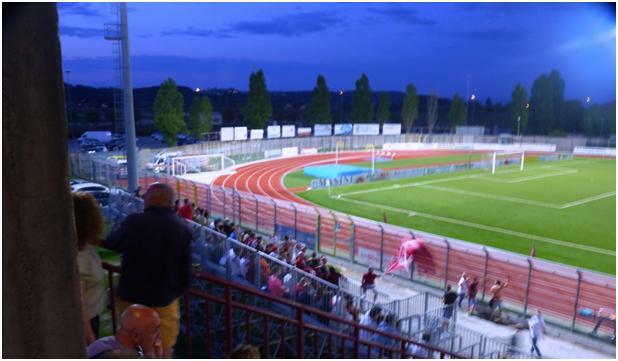 When one realises that Pontedera, like half the Lega Pro clubs cannot average 1000 spectators per game, it is surely no surprise that so many are falling into a financial abyss. 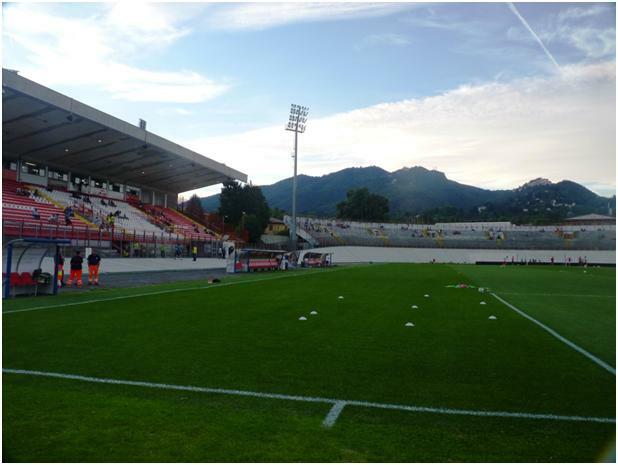 My route through France does not take me close to any matches, so I make a point of adding Varese into the itinerary. Here I choose a hotel good hotel to compensate for the previous two nights staying in bog-standard chain hotels at rather ridiculous prices. The Kyriad in Nice is adjacent to some of the car parks for the new stadium, and I make a note that if the prices return to “sensible” after the high season, it may simplify a trip to the ground. Meanwhile the Palace hotel in Varese is one of aging grandeur, but well decorated . My wife is so impressed we quickly decide to make this the base for both of the last two nights. This is despite the SatNav system failing to pinpoint where the roads to the hotel run. It correctly identified the location of the hotel, but had it as accessed via a steep grass path, rather than the tarmac roadway from the other direction. 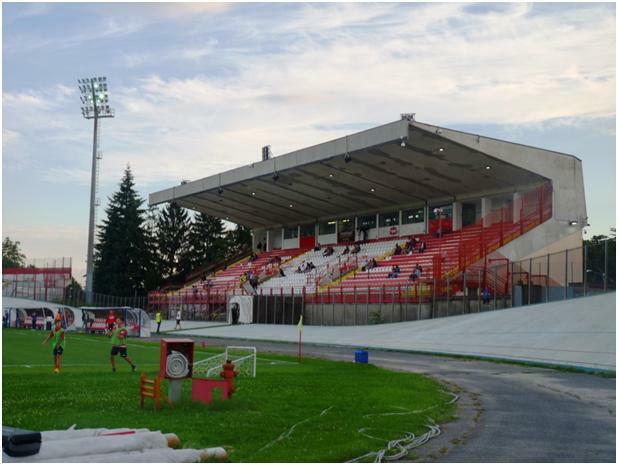 The hotel is only about a mile from the Stadio Franco Ossola – named after a local hero who appeared only a few times in Varese colours before being sold to Torino, where he was one of the “Grande Torino” team who dominated Serie A until the Supergra disaster. To describe the ground as splendid hardly does it justice. It is an oval, as often found in Italy, with curved ends. Old concrete stands, (no specifically marked seats) runs around both ends and the east side, the southern curve – being the away end – is lower than the rest. Most of this is in two tiers, but the front tiers is almost entirely useless, as, as well as having a tarmac track, there is also a cycle track which has been added sometime after the stands were built. From the curves, the lower tier therefore only views the track, and not even the cycles on it. As the backing is reduced on the straights, there is a view of the fencing from here. On the east side, a small gap has been made halfway along, with glass, rather than fences and a bit of cover above. The viewing from here is helped by a gap in the advertising boards (standard modern video type). I reckon half a dozen wheelchairs (with owners) could use this, but there was only one on the day. The main stand is on the west side, a simple construction, with a paddock in front, (although this is also rendered almost useless by the cycle track). AS Varese are Serie B, having dabbled with Serie A only for a couple of short periods in their history, (and with financial ruin slightly more often). Juve Stadia hail from close to Napoli, and have never played higher than Serie B. They were relegated at the end of last season. The visitors were from Castellamare de Stabia, and are the fourth of a string of clubs from the town, (with the current club claiming history from its predecessors), AC Stabia played one season (1951-2) in Serie B, and folded in 1953, the name Juve Stabia came from another club in the town which came to prominence after its rival had folded. This club, actually SS Juventus Stabia had been formed in 1945 and folded in 2001. 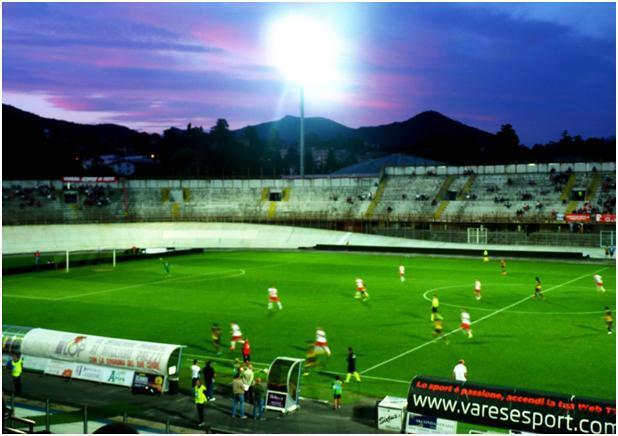 In 2002, a nearby Serie D club, Comprensorio Nola moved into the gap, changing the name to Comprensorio Stabia immediately, and SS Juve Stabia 12 months later. They rose to Serie B in 2011, but were relegated at the end of last season. Juve Stabia had the better of the early chances without really threatening, and the opening goal went to Varese. Pereira Neto claimed a push in the back. I cannot say this was not a foul, but he went down with theatrical relish. It was enough to convince the referee anyway and Arturo Lupoli took the penalty well enough. In the following period, we had chances at both ends, but with both sides employing a single forward formation (4-2-3-1 for Varese, 4-1-4-1 for Juve), one found the midfield was not backing up close enough to have a chance. Both Neto for Varese and Ripa for Stabia had shots parried to a safety. The crowd does not appear to mind this though, and they reserve their venom for the assistant referee who is consistently, correctly (and rather too frequently) raising the offside flag. Varese do make a couple of chances late in the half, which are spoilt by their own lack of competence. Juve Stabia again make a good start to the second half, as they try to get back into the game, but these are fleeting chances which the home defence blocks with ease. In the 53rd minute, Neto surprises most of those in the ground with a speculative lobbed shot from distance. It catches Pisseri in the JS goal well off his line, and the Varese lead is 2-0. It leads to a flurry of activity was William Jidayi, the most impressive of the Juve Stabia midfield lets fly from around 25 yards, with the shot just glancing the lower side of the crossbar to make it 2-1. Even the home supporters applaud this effort, but they are happier a minute later when their team attacks down the right, producing a low cross which Lupoli meets within the six yard box for 3-1. The game has now livened up considerable, with chances at both ends even if the Varese ones look the most likely to be completed. A fine save from Pisseri keeps the score at 3-1 in the 70th minute when Andrea Cristiano has a shot after a good combination move with substitute Luca Tremolada. Just after we see the added time board go up, Juve have a free kick on the left, which is crossed in for Marco Migliorini to get a glancing header and give the 18 travelling supporters a little late hope. Varese seem incapable of holding the ball for the final three minutes to give a comfortable finish, but they are good at tackling back, so Juve Stabia do not get a further chance. I sat in the main stand, having parked in the car park behind the south goal, (nothing was busy for this low key match). The police however, took this as a full scale operation and did not allow anyone back into the car park until all 18 JS fans had left the ground, got into their five cars (in the same car park) and then had a few minutes to get away. The fact that they drove directly into areas where home fans were allowed to be while the same fans were not permitted to go back to where the JS fans had been seemed to be lost. I recommend the ground to anyone, except those requiring a quick departure, (including any attempt to reach the town centre or railway station from the main stand). You are currently browsing the Football Shaped blog archives for October, 2014.